You know that triumphant feeling when you manage to score an affordable product that performs like a high-end one? We certainly do. We mean, who doesn't want (and like) to look good and save some coin in the process? It's the best kind of cheap thrills - literally - that we love, we'd say. And we all know makes *ahem* scouring *ahem* drugstore beauty even more exciting - the constant introduction of new brands. Below, we have newly-launched ranges from brands that have earned themselves cult followings; be it in their place of origin, or internationally. We're thrilled they finally hit Singapore's shores. What: I’m Meme, the inhouse brand of South Korean beauty e-tailer Memebox. From: Seoul, launched in 2014. Background: Memebox has four private labels under it – Nooni, Bonvivant, Pony Effect and I’m Meme. The first three are minimalist – even simple – brands, and the e-tailer was looking to create a more “energetic” one. Enter I’m Meme, the fast beauty brand that doesn’t take a toll on your wallet. How fast is it? The brand rolled out 394 products from 2015 to 2016. Why you should buy it: We like it for its oh-so-cute packaging, what with its heart-shaped lipsticks and eyeshadow-and-cheek-colour “cubes”. Beyond that, the products are created for the fast-paced millennial life. The I’m Meme Multi Cube Eye and Cheek Palette, for example, combines four eyeshadows and a blusher in an on-the-go compact. What’s sold in SG: Only the best-selling products from Seoul are available here; in South Korea, customers are treated to both permanent and seasonal collections. Just the cute bullet is enough to steal our hearts. The lip stain deposits a sheer layer of satin coverage on the lips, and leaves a pretty stain as it fades throughout the day. Get radiant and rosy skin with this cushion foundation that's pretty on your face and your vanity. Makeup multi-tasking in a palette: get your full beat on with this eyeshadow quad and cheek "cube" that slips easily into your beauty purse. Great for on the go touch-ups. What: Antipodes, a clean-certified vegetarian skincare brand. From: New Zealand, launched in 2007. Background: Creating skincare wasn’t initially on the cards for Elizabeth Barbalich. She started out wanting to pursue a greener lifestyle: Her family, with three kids under four years old at that time, was already eating what they regarded as an immune-boosting diet of superfoods, raw juices and supplements. She had also made the switch to green cleaning products. She felt her skincare should be as eco-friendly as the rest of her lifestyle, but couldn’t find products that were hydrating or gentle enough for her dry, sensitive skin. So with her background in biology and medical technology, Barbalich started creating formulas from scratch at home. Why you should buy it: Barbalich tests all trial formulas on her skin for at least 18 months before she green-lights any. Her checklist: Products need to guarantee stronger, more radiant skin with visible results; they have to support collagen, elastin and antioxidant activity; textures should be smooth and velvety. To ensure the brand leaves the smallest carbon footprint, ingredients are either sourced from local producers or harvested from the rainforest. For example, the avocado oil comes from orchards in Hawkes Bay and Northland in the north, while the manuka honey used is from a family-owned supplier that sources it from a Maori tribe in the south. Mamaku black fern and totara (a native hardwood) come from the NZ rainforests. What’s sold in SG: Only skincare, currently. In New Zealand, the brand also offers makeup such as mineral foundations and lipsticks. Its products are sold in 3,000 stores in NZ as well as on its website. Apart from New Zealand manuka honey - known for its anti-blemish and moisturising capabilities - the formulation also includes Persian silk flower extracts to further nourish and brighten the delicate under-eye area. The water-based serum helps to correct dull, blemished and/or uneven skin. Vinanza grape and kiwi - being great antioxidants - also help to reduce skin redness as well. This silky moisturiser not only has manuka honey, but also bee venom and mamaku black fern - both provides a gentle lifting effect. What: Papa Recipe, an organic skincare brand for sensitive skin. From: Seoul, launched in 2012. Background: Founder Kim Han Kyun was one of the first male beauty bloggers in South Korea when he started in his early 20s. He was so interested in beauty that he went on to study and apply for a licence in skincare formulation. He even started his own beauty brand, Costory, in 2012. It flopped because he couldn’t compete with the larger, more established brands. But things changed when he started blending organic jojoba oil at home to soothe his newborn daughter’s eczema. It worked so well on her that Kim decided to sell it online, and launched Papa Recipe that year. Why you should buy it: Kim ensures the ingredients used are gentle enough for babies and pregnant women. The brand’s pioneer range, the Bombee Mask series, is still a bestseller today because it is effective, yet soothing enough for irritable skin. It comes in seven variations: Original Honey, Black Honey (with ceramides), Green Honey (with avocado), Red Ginseng Honey Oil, Whitening Honey (with diamond powder), Rose Gold (with rose and gold extracts), and Honey Butter Cream. What’s sold in SG: Only the Bombee Mask series for now, and only the first four of the seven masks listed above. 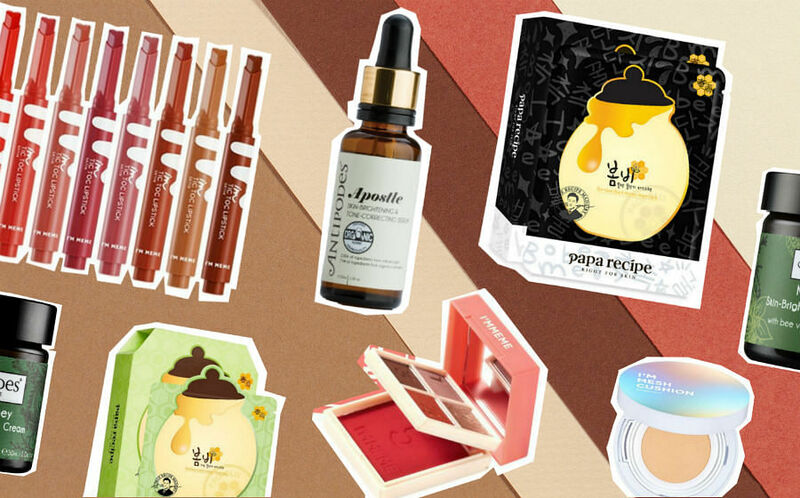 Papa Recipe is sold exclusively online in South Korea, where it offers other ingredient-based skincare ranges, like eggplant and seawater, for different skin concerns. The ranges include cleansers, toners and ampoules. Honey extracts soothe stressed, tired and sensitive skin. Has avocado extracts that deeply moisturises and nourishes skin. Parsley extract, on the other hand, forms a protective barrier on skin against environmental aggressors. Royal jelly infusion helps to intensely replenish moisture and add elasticity to skin. Best for people with (extremely) dry skin. Refine fine lines and lift sagging skin with red ginseng oil. Camelia oil in the serum also nourishes and hydrate dry and weak skin. This story first appeared in the Feburary issue of Her World magazine.